Get your Knotts Berry Farm discount tickets and save money on your visit to this fun amusement park. Don't pay full price as you can find discounts and coupons to fit your budget. Before we discuss the discount tickets, here is the typical ticket price: $79 adults and youth ages 10 and up, children ages 3-11 and seniors age 62 and up $49. Before you pay full price, check out some of the discounts and coupons below. Group discounted tickets - If you have a group of 15 or more friends, family or co-workers, why not enjoy a day at the theme park. You can purchase tickets online for only $49. Online offers - Knotts Berry Farm may offer some online discount tickets on their website. Recently, they offered discount tickets for only $49 for all ages, if you buy in advance and specified which day you will attend. Burger King Coupons - Stop by a participating southern California Burger King restaurant and get a coupon for up to $29 off the main gain ticket price. Valid dates may vary. 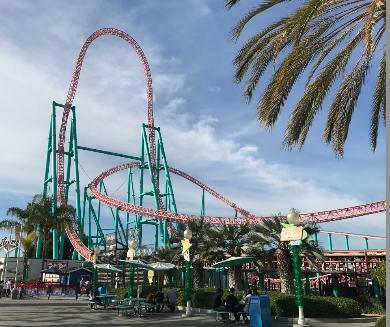 AAA discount - Bring your USA AAA membership card and save 30% off regular admission Knotts Berry Farm tickets and 20% off regular Knotts Soak City waterpark tickets. Knotts Berry Farm support the military troops, fire and law enforcement with some free ticket and discount tickets. Military Tribute Days - Free tickets for active, retired and veteran US military personnel. Limited days are offered, and limited to military person and one guest. Offered November 1 - 16 and November 27 - December 15 2017, other dates in 2018 will vary. Knotts Berry Farm discount tickets for military - Additional tickets can be purchased for up to 6 people at the gate. Spouses of deployed military personnel may also receive free admission and up to 6 discount tickets. Rates are typically $35 to $40 per person. Fire and law Enforcement Tribute Days - Active, full-time fire and law enforcement personnel, including EMTs, may receive free admission tickets for themselves and 1 guest. Limited days are offered, including November 27 - December 15 2017, and January 8 to 31 2018; other dates in 2018 will vary. Up to 6 discount tickets may also be purchased at the gate. Rates are typically $35 to $40 per person.